^ Malinar: 戦士はどんな法に従うべきか、誰の名において従うべきか、そしてクシャトリヤダルマは王という地位にどのような影響を及ぼすのか、誰がそれを守るのか、誰がそれを代表するのか？"[W]hat law must a warrior follow, on what authority, and how does the definition of kṣatriyadharma affect the position of the king, who is supposed to protect and represent it?" 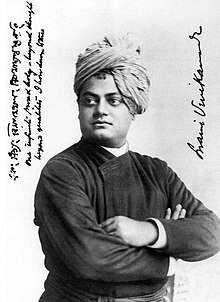 ^ 上村勝彦さんの訳はかなり平易に書き下されているように思えます。Vivekanandaさんの英訳ですともう少しドラマチックな印象を受けます。"Do not yield to unmanliness, O son of Prithâ. It does not become you. Shake off this base faint-heartedness and arise, O scorcher of enemies!" ^ 「悦に入った人生」は直後に出てくる「自我の強権的支配」に対応すると思われる。"...if he or she is to emerge from life victorious..."
^ The emerging self-definitions of Hinduism were forged in the context of continuous interaction with heterodox religions (Buddhists, Jains, Ajivikas) throughout this whole period, and with foreign people (Yavanas, or Greeks; Sakas, or Scythians; Pahlavas, or Parthians; and Kusanas, or Kushans) from the third phase on [between the Mauryan empire and the rise of the Guptas]. 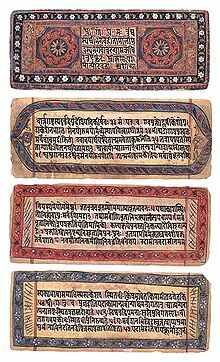 ^ The Bhagavadgita combines many different elements from Samkhya and Vedanta philosophy. 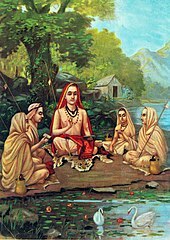 In matters of religion, its important contribution was the new emphasis placed on devotion, which has since remained a central path in Hinduism. In addition, the popular theism expressed elsewhere in the Mahabharata and the transcendentalism of the Upanishads converge, and a God of personal characteristics is identified with the brahman of the Vedic tradition. The Bhagavadgita thus gives a typology of the three dominant trends of Indian religion: dharma-based householder life, enlightenment-based renunciation, and devotion-based theism. ^ The Bhagavadgita may be treated as a great synthesis of the ideas of the impersonal spiritual monism with personalistic monotheism, of the yoga of action with the yoga of transcendence of action, and these again with yogas of devotion and knowledge. ^ "Swadharma is that action which is in accordance with your nature. It is acting in accordance with your skills and talents, your own nature (svabhava), and that which you are responsible for (karma)." ^ This duty consists first of all in standing one's ground and fighting for status. The main duty of a warrior is never to submit to anybody. A warrior must resist any impulse to self-preservation that would make him avoid a fight. In brief, he ought to be a man (puruso bhava; cf. 5.157.6; 13;15). Some of the most vigorous formulations of what called the "heart" or the "essence" of heroism (ksatrahrdaya) come from the ladies of the family. They bare shown most unforgiving with regard to the humiliations they have gone through, the loss of their status and honour, not to speak of the shame of having a weak man in the house, whether husband, son or brother. ^ Even though the frame story of the Mahabharata is rather simple, the epic has an outstanding significance for Hindu heroism. The heroism of the Pandavas, the ideals of honor and courage in battle, are constant sources of treatises in which it is not sacrifice, renunciation of the world, or erudition that is valued, but energy, dedication and self-sacrifice. 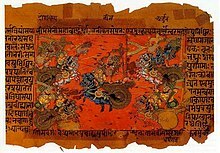 The Bhagavad Gita, inserted in the sixth book (Bhismaparvan), and probably completed in the second century A.D., is such a text, that is, a philosophical and theistic treatise, with which the Pandava is exhorted by his charioteer, Krishna, among others, to stop hesitating and fulfill his Kṣatriya (warrior) duty as a warrior and kill. ^ "Arjuna represents the individual soul, and Sri Krishna the Supreme Soul dwelling in every heart. 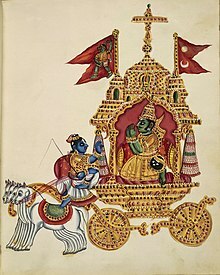 Arjuna's chariot is the body. The blind king Dhritarashtra is the mind under the spell of ignorance, and his hundred sons are man's numerous evil tendencies. The battle, a perennial one, is between the power of good and the power of evil. The warrior who listens to the advice of the Lord speaking from within will triumph in this battle and attain the Highest Good." ^ This Kurukshetra War is only an allegory. When we sum up its esoteric significance, it means the war which is constantly going on within man between the tendencies of good and evil. ^ It is not the story of some people that lived sometime ago but a characterisation of all people that may live at any time in the history of the world. ^ Here in the Bhagavad Gita, we find a practical handbook of instruction on how best we can re-organise our inner ways of thinking, feeling, and acting in our everyday life and draw from ourselves a larger gush of productivity to enrich the life around us, and to emblazon the subjective life within us. ^ a b c Michaels 2004, p. 59. ^ a b c d Deutsch & Dalvi 2004, p. 60. ^ a b c Deutsch & Dalvi 2004, p. 61. ^ a b c d e f g Scheepers 2000. ^ a b c d e Raju 1992, p. 211. ^ a b c d Deutsch & Dalvi 2004, pp. 61-62. ^ a b c d e f g h Hiltebeitel 2002. ^ Raju 1992, p. 211-212. ^ Deutsch & Dalvi 2004, p. 62. ^ Nicholson 2010, p. 7. ^ Singh 2005, p. 37. ^ Pandit 2005, p. 27. ^ Deutsch & Dalvi 2004, p. 59-61. ^ Max Bernhard Weinsten, Welt- und Lebensanschauungen, Hervorgegangen aus Religion, Philosophie und Naturerkenntnis ("World and Life Views, Emerging From Religion, Philosophy and Nature") (1910), page 213: "Wir werden später sehen, daß die Indier auch den Pandeismus gelehrt haben. Der letzte Zustand besteht in dieser Lehre im Eingehen in die betreffende Gottheit, Brahma oder Wischnu. So sagt in der Bhagavad-Gîtâ Krishna-Wischnu, nach vielen Lehren über ein vollkommenes Dasein." ^ a b c d e Fowler 2012, p. 2. ^ a b Hacker & Halbfass 1995, p. 261. ^ a b Miller 2004, p. 3. ^ Malinar 2007, p. 36–39. ^ a b Malinar 2007, p. 38. ^ Malinar 2007, p. 39. ^ Michaels 2004, p. 278. ^ a b Malinar 2007, p. 36. ^ a b Hacker & Halbfass 1995, p. 264. ^ a b c d e f Hacker & Halbfass 1995, p. 266. ^ a b Hacker & Halbfass 1995, p. 267. ^ Easwaran 2007, p. 15. ^ Gandhi 2009, First Edition 1946. Other editions: 1948, 1951, 1956. ^ A shorter edition, omitting the bulk of Desai's additional commentary, has been published as: Anasaktiyoga: The Gospel of Selfless Action. Jim Rankin, editor. The author is listed as M.K. 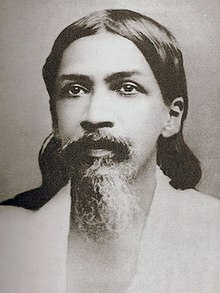 Gandhi; Mahadev Desai, translator. (Dry Bones Press, San Francisco, 1998) ISBN 1-883938-47-3. ^ Gerald James Larson (1981), “The Song Celestial: Two centuries of the Bhagavad Gita in English”, Philosophy East and West: A Quarterly of Comparative Philosophy (University of Hawai'i Press) 31 (4): 513–540, doi:10.2307/1398797, JSTOR 1398797, http://jstor.org/stable/1398797. ^ a b Hijiya, James A. (PDF). The Gita of Robert Oppenheimer" Proceedings of the American Philosophical Society, 144, no. 2. http://www.amphilsoc.org/sites/default/files/proceedings/Hijiya.pdf 2013年12月23日閲覧。. ^ Quotation from M. K. Gandhi. Young India. (1925), pp. 1078–1079, is cited from Radhakrishnan 1993 Front matter. Ramsukhdas, Swami (1994) (Sanskrit and Hindi). 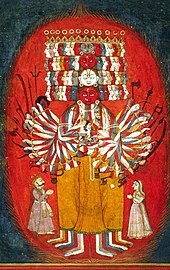 Srimad Bhagavadgita. 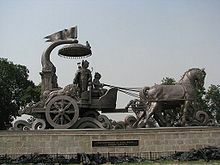 Gorakhpur, India: Gita Press. ISBN 81-293-0001-X. http://www.gitapress.org 2014年6月11日閲覧。. ^ artofliving.org, What Is Swadharma?